I have to say in hindsight I didn't do that great of a job documenting my 3 days at VK Live held here in Los Angeles last weekend. I guess I was having too much fun the first 2 days working in the BagSmith booth to go and check things out. By the third day when I did finally go around I was a little disappointed with the photos I was getting from my camera so I didn't go too crazy. The best thing about the show was meeting & working with Becca, her mom Jean and her sister Shelly. Becca and I have been internet friends for awhile but this was the first time meeting in person and we all hit it off. Our mutual friend Vicki Stiefel joined us and was signing copies of her book, 10 Secrets of the LaidBack Knitters (a wonderful book for your knitting library but that's another post!). Another great thing about the show was meeting Lisa who stopped me because she recognized the sweater I was wearing from following my blog! This was the first time that ever happened to me, so I of course was walking with a little extra spring in my step the rest of the day. Thanks Lisa! I was planning on writing more about the show but I have so much knitting to catch up on I'll be brief. RedFish Dye Works had a lovely booth with amazing colors! I don't even mind that this shot is blurry because the colors are so great... though I'm never going to a show again without my Nikon! I love this Namaste bag! Stylish & functional my favorite combination. Jean refreshing my Tunisian crochet skills. Jean was probably the most photographed person at the show. You can't tell from the photo but Jean has a bit of purple in her bangs making her that much more adorable (and attractive to shutterbugs) and is just the sweetest person. For 3 days she showed countless people how to Tunisian crochet & to knit using the big needles and hooks that the BagSmith is known for. At the end of the show Becca sent me home with a lot of yarn to work with. 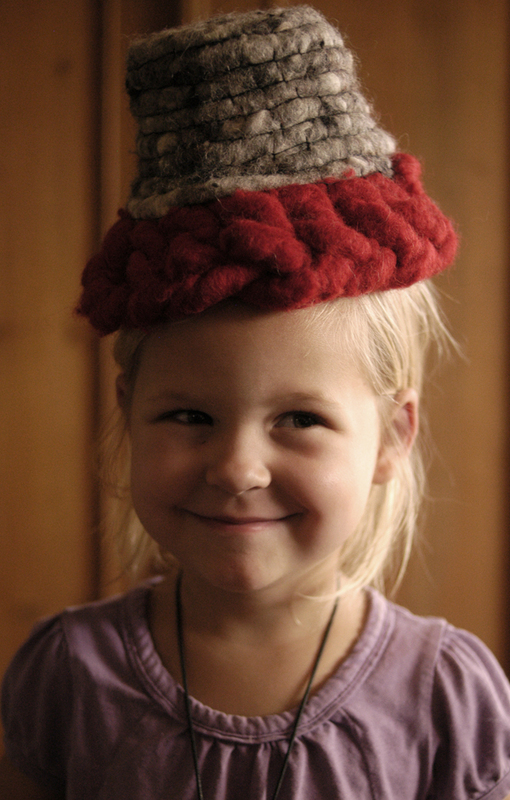 I really liked this yarn from Holland. 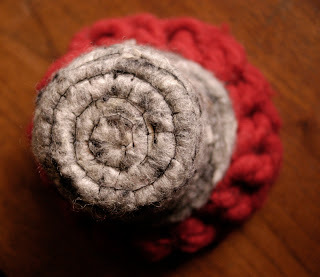 It's a thick felted strand with a wire core. I made this bowl in a couple of hours. The red part is finger crocheted while the bottom is coiled and it's all joined with a mattress stitch. Someone had other ideas for it! Another yarn she sent home with me is called "Big Stitch Yarn Bumps". It's a alpaca/wool blend with a bit of nylon. All the animal fibers are from local Ohio breeders and I love it! This is one big ball of yarn! The girls had fun with it too! I'm working with a pair of #50's that Becca also sent home with me and it's working up just how I like it, fast! I'm still working on it though so back to work! Oh one other thing that the BagSmith carries is a line called Sajou worth checking out for the packaging alone, beautiful! Wow! That event looks like it was fun! 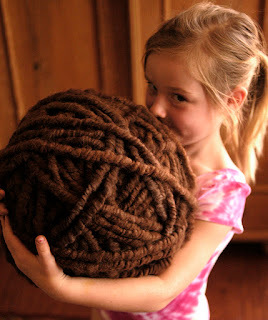 I love that huge ball of yarn. Can't wait to see what you come up with using that. I'm not sure what Tunisian crocheting is. I'll have to check that out. As always, I really enjoy reading your posts! WOW ! what fun, who has time for photos with all that going on :D ..and I really love the bowl (hat ;) you made - it's gorgeous ! Wow, looks like it was an amazing time!! 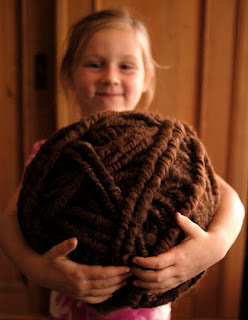 that is the biggest yarn I've ever seen! It was so great to meet you in person! Your sweater is even more gorgeous than in pics and obviously I would recognize it anywhere:). 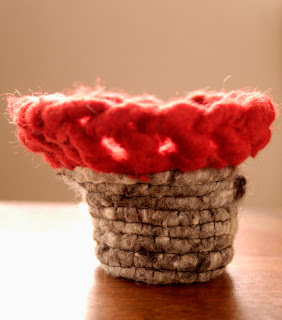 And wow - that yarn is amazing!